This is the Fun, 2014-15, oil, acrylic and archival digital print on linen and canvas, 70 x 96 inches. 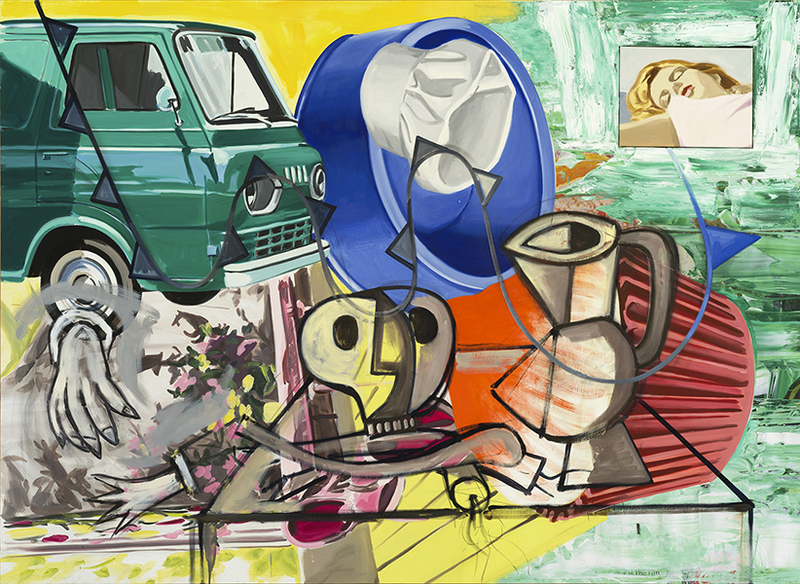 Copyright David Salle VAGA, NY. 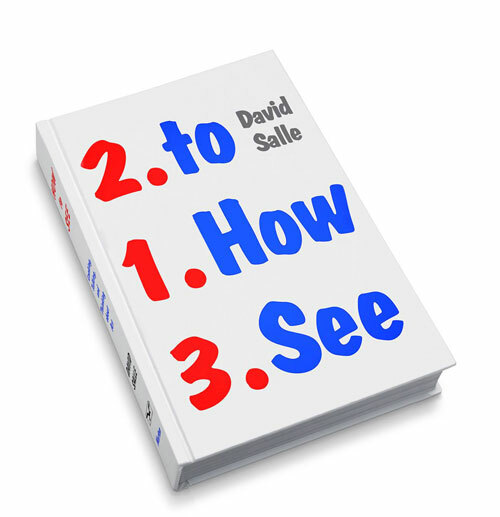 Contributed by Rob Kaiser-Schlatzlein / David Salle, in the 1980s an enfant terrible of painting, has published How to See, a collection of essays on art and artists written over the course of some thirty years. While many people do not know Salle as a writer, recently he has had a regular column in Town and Country and has been teaching a writing class at Bruce High Quality Foundation University. Joyously anecdotal, his book is full of upbeat takes on art and artists, presented straightforwardly. For the most part, the reviews have been good. The Paris Review offers a series of well-chosen excerpts. Salle has flair for prescient summation. It’s clear from most interviews with the painter that he is an enjoyable and lively speaker, as he is a writer. Salle to Carl Swanson at Vulture: “I’m older now. When I was young, I would never tell anecdotes…. I thought they were irrelevant. But it seems like all anyone wants to hear.” Accordingly, the book is a sort-of memoir (apparently he’s working on a real one now). Swanson’s article highlights what a comfortable dandy David Salle is and quotes from Janet Malcolm’s 1994 profile of a self-consciously aging Salle called “Forty-one False Starts.” In Malcolm’s article, he reflects on the challenge of being interviewed so frequently and confesses to enjoying the sport of it. A conversation with Emma Cline in Interview indicates that Salle likes and identifies with writers and writing, and is proud of his friendships with literary figures. Now he wants to participate in their arena. Salle refers to his esteemed friend George W.S. Trow and writers like Manny Farber on many occasions in the book. His model, though, is Fairfield Porter, a brilliant critic and painter who also wrote mostly about the art of others. The difference (and “raison d’etre,” as Salle says) is that his audience was specifically writers and artists, not the public, curators, collectors, or academics. The latter, however, will no doubt be able to appreciate this book. Most of the essays are laudatory, though he does castigate Thomas Houseago and in Interview admits that he can be “cranky.” Salle seems wise to leave most of his negative opinions unpublished; devoting so much time to something that you don’t like is probably bad for the outlook of a painter. Even his more snarky writing is diplomatic and empathetic. For example, his mixed assessment of the work of Frank Stella — who he says ran out of good ideas at some point — is, like the rest of the book, rooted in generosity and understanding. “I don’t take it back,” he says. “I took such pains to say what a great champion Frank is. And all great champions fall.” He believes Stella’s long life may have diminished the overall quality of his oeuvre. “That is the subtext.” He adds, philosophically, that “art is long, life is long. And yet there are moments when it burns white-hot and moments when it doesn’t.” That seems a sage observation of how life goes, from another famous, white male painter who too once burned white-hot. Typing, Thinking, 2015, oil, acrylic and archival digital print on linen, 68 x 44 inches. 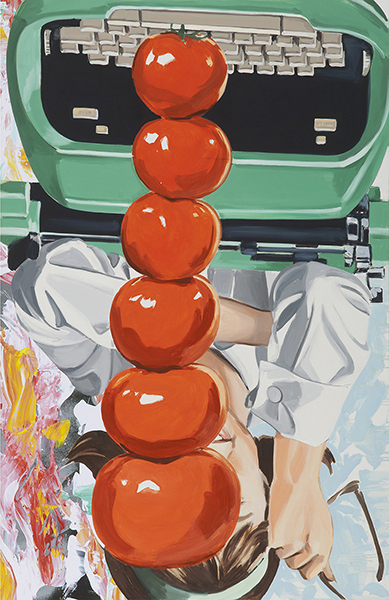 Copyright David Salle VAGA, NY.